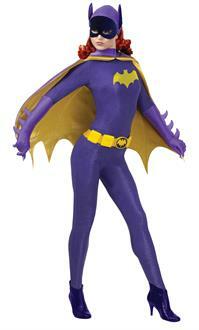 Includes: back zipper purple jumpsuit with printed yellow bat symbol and stirrup leggings, reversible purple/yellow cape with batwing fringe, yellow utility belt, purple gloves and matching bat ear headpiece/mask with attached hair. Does not include shoes. This is an officially licensed Batman costume.